Game informer has an exclusive look at the new Batman game called ‘Arkham Asylum.’ Batman: Arkham Asylum is being developed by Rocksteady Studios and co-publishers Eidos and WBIE. The story, co-written by Paul Dini, will explore Gotham’s Arkham Asylum, where the Joker was sentenced to for crimes committed earlier. When the prison has a routine transfer, something goes terribly wrong, and the Joker takes over Arkham with all his evil minions. GI remarks the dark and gritty setting to be reminiscent of Bioshock. The game takes after the comics (EA owns the rights to the movie license, which means there still may be a game based on 'Dark Knight' the way. GI mentions you will see some of the villains during the gameplay, such as the Joker, Harley Quinn, Killer Croc, and Zsasz. The article also noted they saw some concept art of the game and confirmed they saw the Penguin, Riddler, Scarecrow, Poison Ivy, and Mr Freeze. More villains are also planned but have not yet been revealed. Game Informer also found out the player can travel anywhere and anytime in Arkham. You are not limited to certain areas, but you can roam the Asylum freely as you please. Think that Arkham Asylum is Batman’s Liberty City. The combat isn’t a traditional stealth game. The developers think a ‘regular’ stealth game makes the player look weak. Something they feel Batman is not. Judging from this, it looks like we may finally get a good Batman game! Eidos Interactive and Warner Bros. Interactive Entertainment on behalf of DC Comics announce Batman: Arkham Asylum, a dark, action-packed videogame adventure for Xbox 360(R) video game and entertainment system from Microsoft, PLAYSTATION(R)3 computer entertainment system and Games for Windows in 2009. In Batman: Arkham Asylum, developed by Rocksteady Studios, the player assumes the role of Batman as he delivers The Joker to Arkham Asylum. There, the imprisoned super-villains have set a trap and an immersive combat gaming experience unfolds. With an original script penned by Emmy Award-winning Batman writer Paul Dini, the game brings the universe of DC Comics' detective to life with stunning graphics. "In Batman: Arkham Asylum Eidos and Warner Bros. are building a true action adventure game experience worthy of gamers and fans," said Phil Rogers, CEO of Eidos Interactive. "Players become Batman, like he has never been seen before in a video game, as he fights through intense circumstances in Arkham Asylum utilizing his intuitive detective skills and aggressive melee attacks." 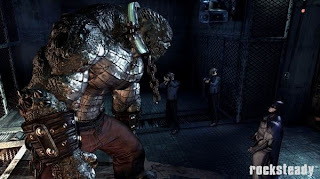 "Batman: Arkham Asylum offers players the chance to battle Gotham's worst villains with Batman's physical and psychological strength in a graphically distinct and story-driven game," said Martin Tremblay, President, Warner Bros. Interactive Entertainment. "We look forward to working with Eidos on expanding DC Comics' world-renowned character Batman in the game space with a noticeably different feature set in an incredibly dark interactive environment." 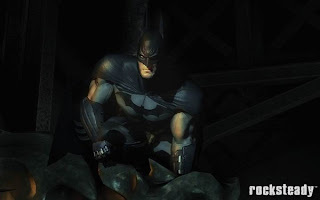 Eidos Interactive and Warner Bros. Interactive Entertainment will co-publish Batman: Arkham Asylum in North America, Eidos Interactive will publish the game in all other territories. Eidos Interactive is the creator of some of the world's leading videogame properties. Eidos Interactive consists of offices across Europe and the US and several development studios including Crystal Dynamics, IO Interactive, Beautiful Game Studios and Eidos Montreal. The Group has a valuable combined portfolio of intellectual property including: Tomb Raider, Hitman, Deus Ex, Championship Manager and Just Cause. Eidos Interactive is part of SCi Entertainment Group Plc (SEG). Warner Bros. Interactive Entertainment, a division of Warner Bros. Home Entertainment Group, is a premier worldwide publisher, developer, licensor and distributor of entertainment content for the interactive space across all current and future platforms, including console, handheld and PC-based gaming for both internal and third party game titles. BATMAN and all related characters and elements are trademarks of and (C) DC Comics. The concept definitely sounds amazing. Let's just hope that the execution is too. I haven't seen Penguin mentioned as one of the villains being in the game just yet, but I can imagine that being a really amazing battle. Let me know if you have any questions. I hope you don't mind me commenting on your blog, by the way. If you enter, send me an e-mail and I'll be happy to vote for your design. Good luck. Ah, I missed the mention of Penguin in your post earlier. Nice!